Home » Uncategorized » You Asked, We Answered: Are UW- Madison Faculty and Staff Wisconsin Union Members? You Asked, We Answered: Are UW- Madison Faculty and Staff Wisconsin Union Members? The Wisconsin Union is a membership organization, offering major benefits to our members, including discounts, special events and more! As University of Wisconsin – Madison faculty and staff, it is frequently asked whether you are a Wisconsin Union member, long story short, you’re not– yet! UW- Madison faculty and staff are welcome to use the Union as associates of the University, where you can enjoy limited Union privileges such as the ability to buy beverages at both Unions and enjoy the free live music events and movies. To receive full benefits, however, you must purchase a Union membership. But, have no fear, because we, at the Wisconsin Union are offering a never-before membership exclusively for UW- Madison faculty and staff. 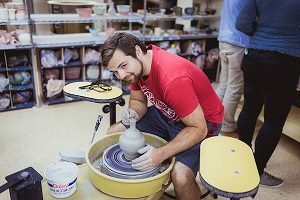 If you’re looking to brush up on your arts and crafts or looking to learn a new hobby, you will be happy to hear Wheelhouse offers member-exclusive classes and discounts. And remember, the next time you are looking for a space for a family event or get-together, as a Union member you are offered free room rentals at both our Memorial Union and Union South locations. So, if you are a Union-lover and are a UW-Madison faculty or staff member there is no better time to reap the benefits of becoming a member! Still not convinced? Here’s a quick recap of some perks of being a Union member, because who doesn’t like perks? Discounts on classes, supplies and access passes at Wheelhouse Studios, as well as members-only classes! Outdoor UW equipment rentals, at a discounted price! But wait, there’s more! A Wisconsin Union membership offers so much more than what you see here! To get a comprehensive list of all the first-rate advantages to becoming a Union member, go to: union.wisc.edu/become-a-member. So, what are you waiting for? To get your UW- Madison faculty and staff membership go to: payments.union.wisc.edu/membership-options.